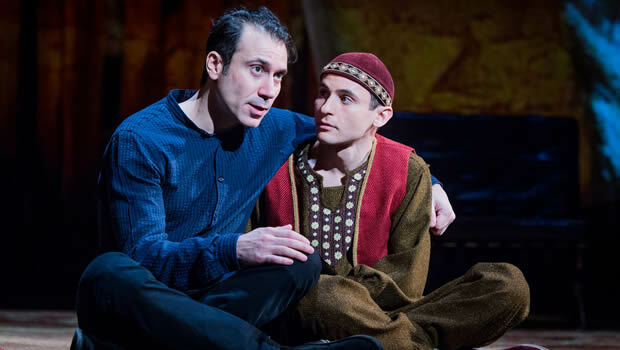 Lifted from Khaled Hosseini's award-winning novel, The Kite Runner swoops into Wyndham's Theatre following a UK tour. It's easy to see why now is the time for this mesmerising story to come to the West End; when war and refuge are prevalent topics in the world, and Giles Croft’s cautious, yet captivating production proves entirely spellbinding. Based on Hosseini’s own upbringing, The Kite Runner is told through Amir’s growing up in Afghanistan, alongside his servant, Hassan. There’s plenty of twists and turns, both heart-breaking and touching, particularly for those who have somehow bypassed the book. When Amir and Hassan are inevitably separated, Amir is left with a guilt that grips him throughout his life. Ben Turner is quietly commanding as Amir, moulding the story before our eyes. He remains on stage throughout, switching ably between childhood, adulthood and narration. Multi-roling is excellently used in this production, with Nicholas Karimi giving a disgusting yet admirable performance as bully Assef. But it’s Andrei Costin who captures hearts as Hassan, the unbearably trusting servant who would do anything for his master. Simply put, The Kite Runner is storytelling at its finest. Using a modest, versatile set, designed by Barney George, with powerful lighting design by Charles Balfour, the stage morphs from the hot, fiery Afghanistan to the towering skyline of San Fransisco. It's marvellous to look at, and you find yourself holding your breath without even realising. At times, a more brutal director would have made a few cuts here and there, however Matthew Spangler’s adaptation ensures that no detail is missed. It makes for a production that burns slowly, but brightly. With themes of war, separation, refugees and extreme crisis, it’s an incredibly poignant production, both hard-hitting and upsettingly relevant, but most of all it begs us to listen, to understand and to open our eyes that little bit more. A stunning adaptation of an incredible story, The Kite Runner is packed full of stellar actors who hold the audience’s hand through an exhausting emotional journey. It’s going to stay with me for a long time.